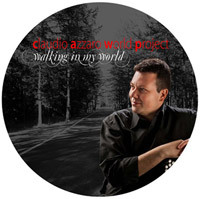 Album Description: Walking on My World. 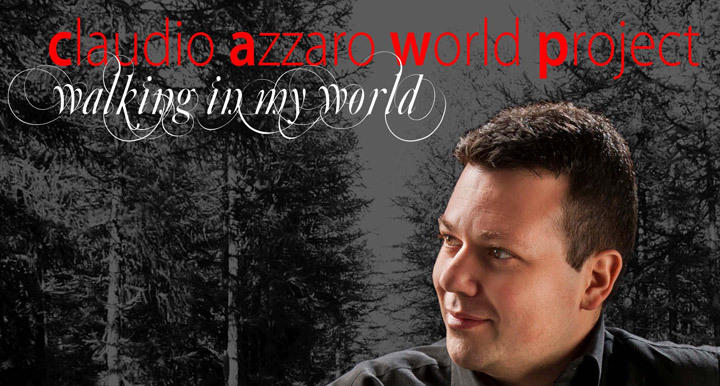 In this first recording production, I have searched to recap all my different musical and educational experiences, to create a music project that symbolizes an ideal wander into the most exciting international melodies. My precious fellow travellers are: the great expert of latin music, Davide Bernaro (percussion), Lorenzo Di Marcoberardino (guitar), who has an intense knowledge of flamenco and Emiliano Macini (double bass), who has a lot of important collaborations in the areas of classical music and jazz. 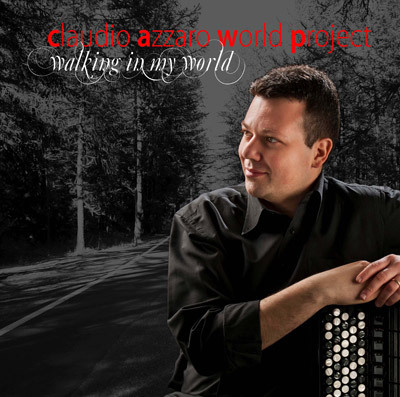 Claudio Azzaro began his accordion study with Luigi Montefiore and Dante Simonelli; then he specialized in the modern accordion, in arrangement and improvisation with Renzo Ruggieri. He graduated in classical accordion from the Consevatory of Foggia "U. Giordano" under the leading tuor, Massimiliano Pitocco; he graduated in "Teaching Music" from the Conservatory "L. D'Annunzio" of Pescara and he also graduated in Music (Interpretation and Composition) from the Conservatory "A. Casella" of Aquila with Dario Flammini. He also had specialized tuition with famous tutors: Max Bonnay, Cesare Chiacchiaretta, Frederic Deschamps, Joseph Moreno, Adriano Ranieri, Annibale Rebaudengo, Mika Vayrynen. Claudio Azzaro won competitions, including Recanati, Morro D'Oro, Acquasparta, Ascoli Piceno, Piombino, Laina. Claudio has toured in Italy, France, Switzerland and Germany. 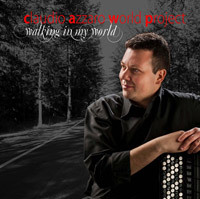 He has been the founder and the artistic director with Renzo Ruggieri of the "Accordion Art Festival". Now he has different musical projects, ranging from classical music to world music. He's been appointed to the jury of the most important competitions in Italy and strongly involved in teaching. Collaborations: Jo Di Tonno, Lino Banfi, the "Choral group Braga" of Biulianova, the University of Termamo and the society "Primo Riccitelli" of Teramo.